The Tummy Tuck Belt claims that by wearing its belt and using its miracle cream it can melt your belly fat away in just 2 ten minute sessions a day. The way the system works is you apply the thermal accelerator cream and wear the belt. You do 2 minutes of standing abdominal exercises and then leave the belt for further 8 minutes. After 10 minutes apparently this activates the fat burning chain reaction and will start burning fat for the next few hours. It claims that typically you can lose 0.5" first week and 1" in 30 days without any lifestyle changes. 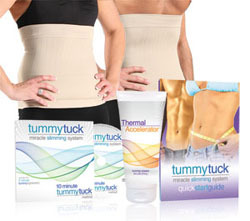 With your help we can reach more people and let them know about Tummy Tuck Belt whether this product works or not. Purchased this in January, and have YET to get the thing. Not happy. I love how these companies are selling from the outside in: promote the heck out of something, prove to investors your crazy idea is worth funding, then take orders for it. Brillant, except you're not actuallually mailing these out. "Backordered" is the status. Ridiculous. no one can be reached via phone.